It’s that time of year again. The temperatures are soaring, football season is about to gear up and Hatch green chiles are in season! What? Never heard of Hatch green chiles? I guess that they aren’t as common down in South Texas as they are where I’m from in West Texas. 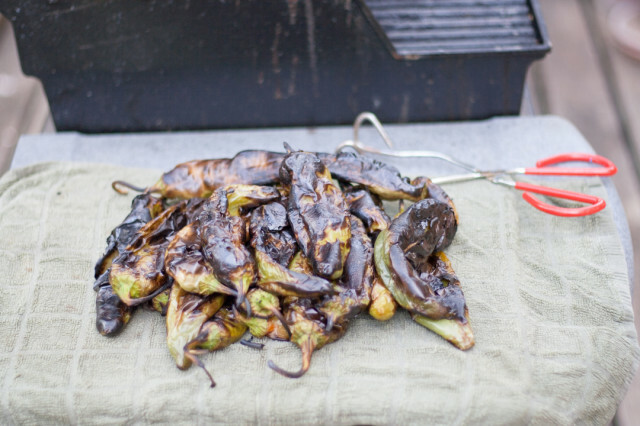 But with the advent of Central Market’s Green Chile fest, it seems that more and more folks are trying to learn how to roast Hatch green chiles. So let me show you how. 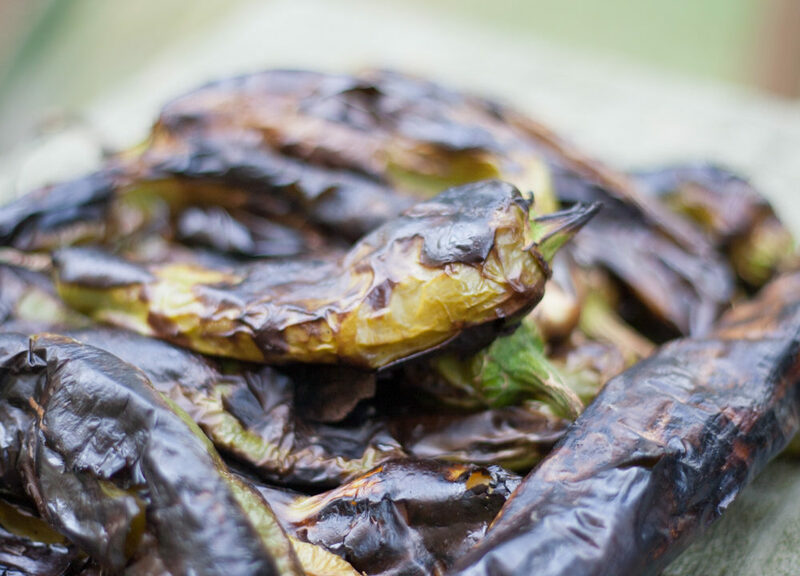 Hatch green chiles come from Hatch, New Mexico and are a staple of New Mexican cuisine. If you have ever taken a trip through New Mexico, you probably noticed that you can get green chiles on practically EVERYTHING—pizza, sandwiches, eggs and burgers just to name a few. On a recent trip up, I even came across green chile wine! While I was born in Texas and definitely have the West Texan accent, my mom is from Santa Fe, NM so green chiles were part of my childhood. And I’m thankful that they were. They can pack a bite that is far different than a serrano or a jalapeño while having a savory taste that can be used in cooking with an array of food. While you can buy them already roasted at HEB, I figured I would let you know how to roast them so you can enjoy them yourself without having to pay a premium. First, heat up your grill REAL hot. Spread out some green chiles across it. Close the lid and kind of listen for them to sizzle. This is the site of deliciousness about to be roasted. When you hear the sizzle, open the grill up and flip ’em over. You want to make sure that the skin is good and blistered. 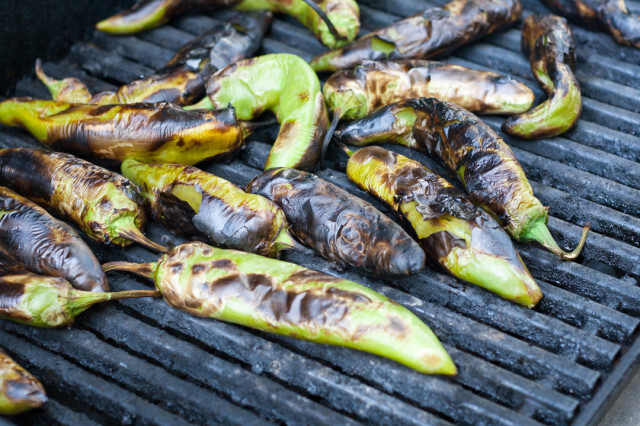 When you open the grill, breath a deep breath in and enjoy the smell of roasted chiles! Continue to roast the other side, and even the edges. Get them where all the skin is blistered. This will help you peal it off when you are ready to cook them. Prepare a cutting board with a wet towel on top of it. As your green chiles are ready to come off, place them on this wet towel and then cover them up with another wet towel. This is to get the steam to continue to cook them. As I get a good stack of them, I will take the cutting board inside, pull the towels/chiles off, and replace with new towels so they can continue to steam a little bit. Don’t forget to have a damp cloth below and on top of the chiles to steam them when they come off the grill. Finally, after you are finished cooking the chiles, let them all cool down before you bag them and place them in your freezer. I put around three to a bag because depending on who will be eating my dish—whether they like hot/medium spiced food—I will use either three to six green chiles. Some people choose to take the charred skin off right now, I happen to just wait to do that whenever I defrost them. HEB says that they last six months, but I have been known to let mine freeze for way longer than that. 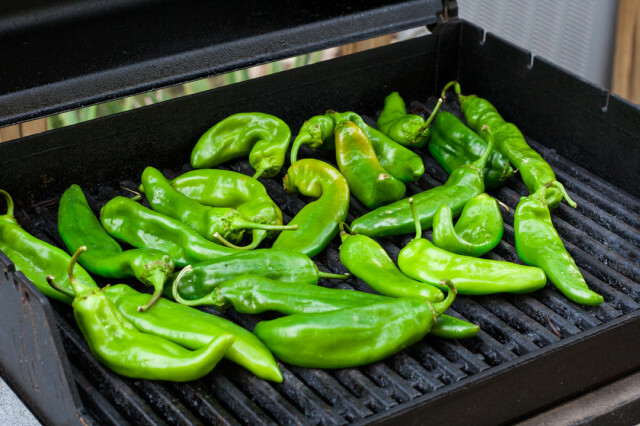 Get out there, grab some green chiles and start roasting!